It’s green, and it costs a lot of green. 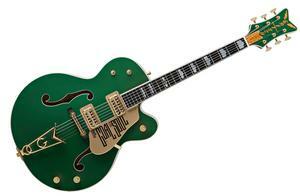 Gretsch Guitars has collaborated with Bono to create a version of his Irish Falcon guitar for the guitar-playing public. The “Goal Is Soul” guitar is similar to what Bono is currently using for the Vertigo tour and includes the U2 frontman’s engraved signature. The asking price? 3600 buckeroos U.S. (3000 EUR / 2000 GBP). it´s a lot of money, yes, but it´s a reasonable price, in the range of a 12 string rickenbacker. this series is japan made, as are all stock gretsch these days. bono´s is custom made, these are still manufactured in the US. very very nice intrument, that´s for sure ;), no matter if you´re a purist or not..
just out of curiosity: is this typical for artists? for example, does edge have a signature guitar? no edge doesn´t, though he has these variax 700 acoustic guitars (line6) on the current tour, one with vertigo logo (lapoe, the fly) plus a special custom made distortion rack unit (line6dm4/dm pro??!). no signature guitars for edge though. he´s simply using too many different instruments and likes to keep his fredom of choice, whereas bono doesn´t play that many different guitars, and as far as i know it´s only the irish falcon for elevation and vertigo tours anayway. thanks for the info bernhard. it is a freakin’ cool guitar, no doubt. wish i had the cash to buy one. or the skill to play one for that matter.